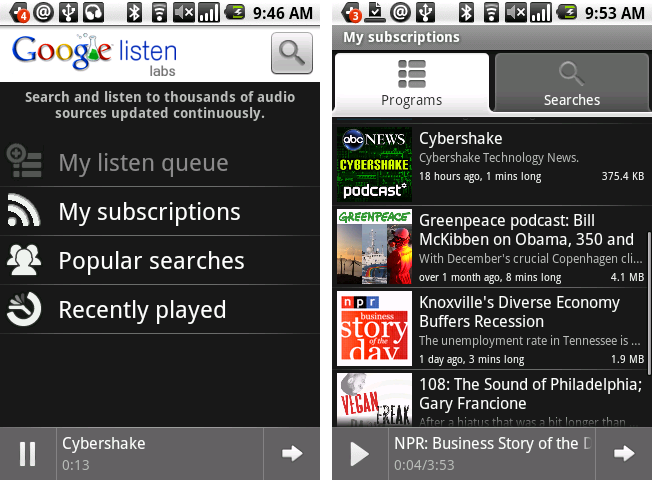 Listen is a Google Labs experiment and by far my new favourite Android app, and a must for anyone with an Android phone. Listen is basically a web audio / podcast discovery app that allows you to search, subscribe, download and stream in such a simple way that I found my listen queue filling up pretty quickly. Downloading has been easy & quick enough through 3G; haven’t bothered with WiFi since it downloads speedily and I can actually make a dent into my normally wasted data plan. You can tell that it’s a Labs experiment though, with a few strange things that stood out initially, but no doubt Google will be all over it soon enough, and I’m eagerly awaiting v1.0.4. Coincidentally, my love of Listen has a great deal to do with the gloriousness that is TWiT [This Week In Technology]. I humbly apologise to @renny510 and @pkattera for not heeding your advice earlier. I’ll probably have another mini rant about it sometime, but I’m already waiting for the next episode with as much anticipation as I would a JJ Abrams TV show. Luckily there’s a backlog of 200+ episodes that I can fall back on, not to mention the broader TWiT network, with podcasts like TWiG [This Week In Google] and others from Leo and the gang.